No change in status of Unit 1, 2, or 3 or the SFPs. Three documents noted in the sit report are being refined; criteria to reduce 50 mile evac zone, limited reentry, and plant stability criteria. discussed at the interagency working group. The Chairman approved a plan to reduced staffing in the NRC ops centers. No reduction in number of NRC personnel working in US Embassy for the “foreseeable future.” More NRC personnel will be cycled to relieve team members (at this stage, it is not clear what all 11 staff members are doing given the plant conditions have stabilized). Secretary Clinton will visit Tokyo on or about April 18. 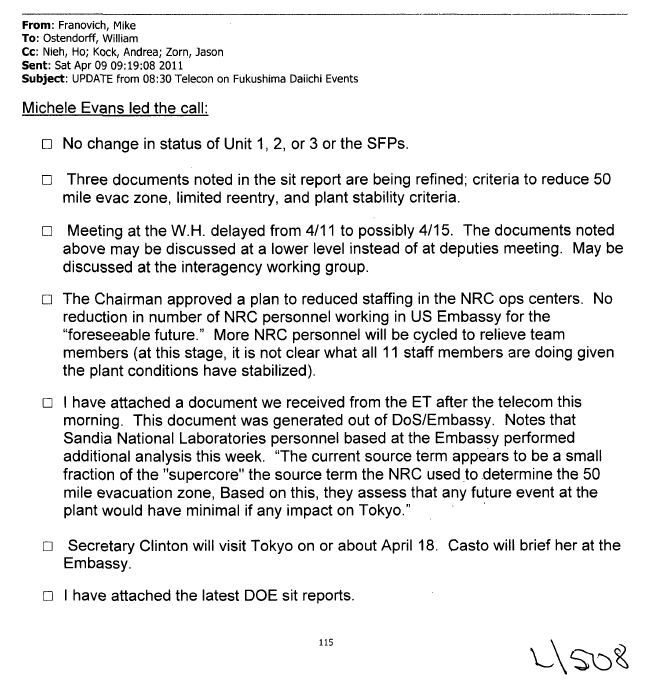 Casto will brief her at the Embassy. I have attached the latest DOE sit reports.